Columbine begins its annual growth in our garden. 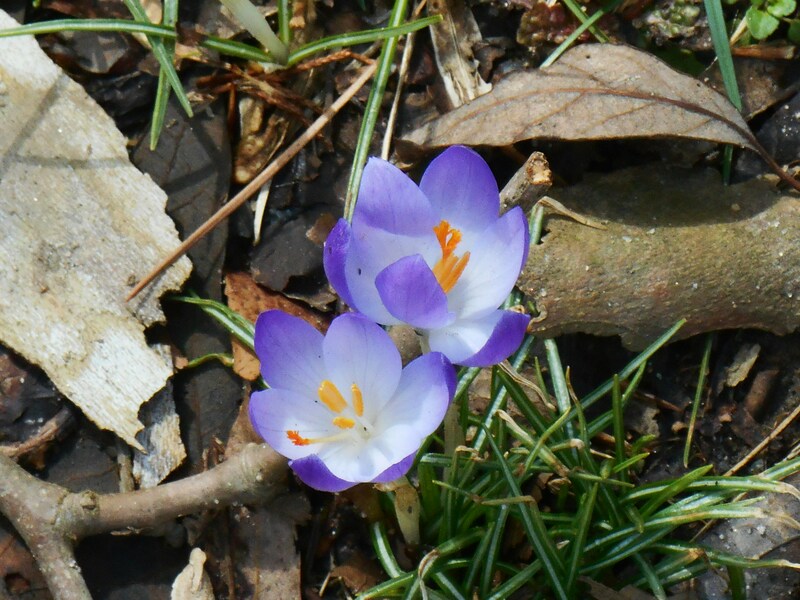 Warmer days this week drew us outside to begin cutting back the dead branches of perennials, pull mouldering leaves out of planting beds, and look for the many tiny signs of spring. Autumn leaves have found lodging everywhere, it seems. Too wet to shred, we will leave them to mulch the soil a bit longer. 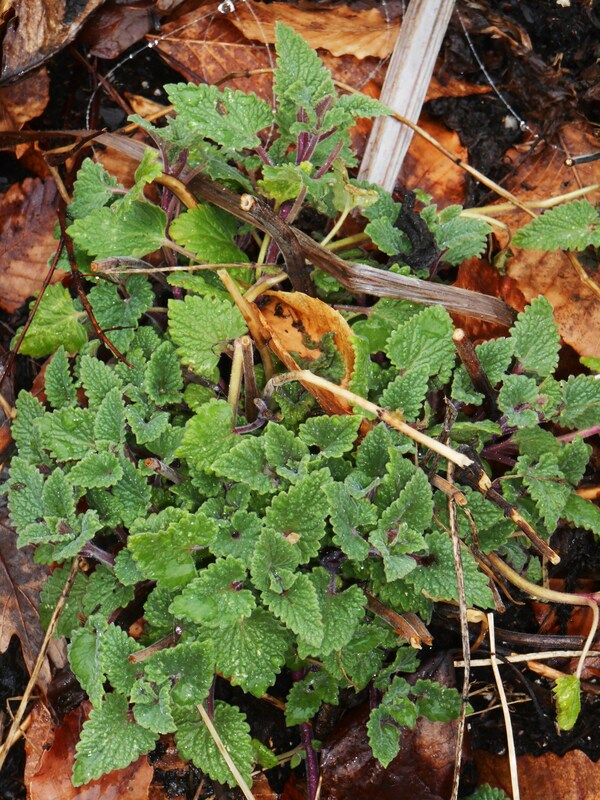 Catmint has reappeared in the stump garden. I was a little surprised to see abundant growth of new leaves on the catmint once last summer’s stems were cleared away. 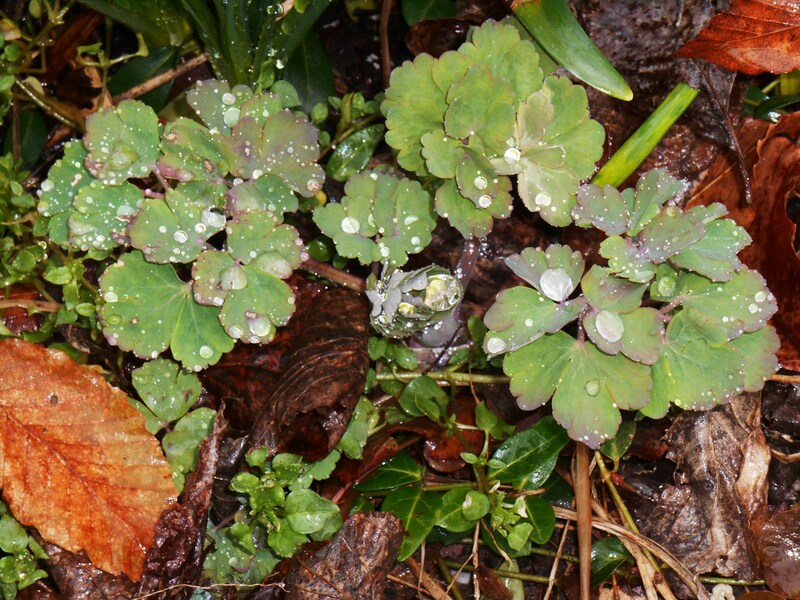 Tiny green shoots of Comphrey poke a few inches above the moist soil. 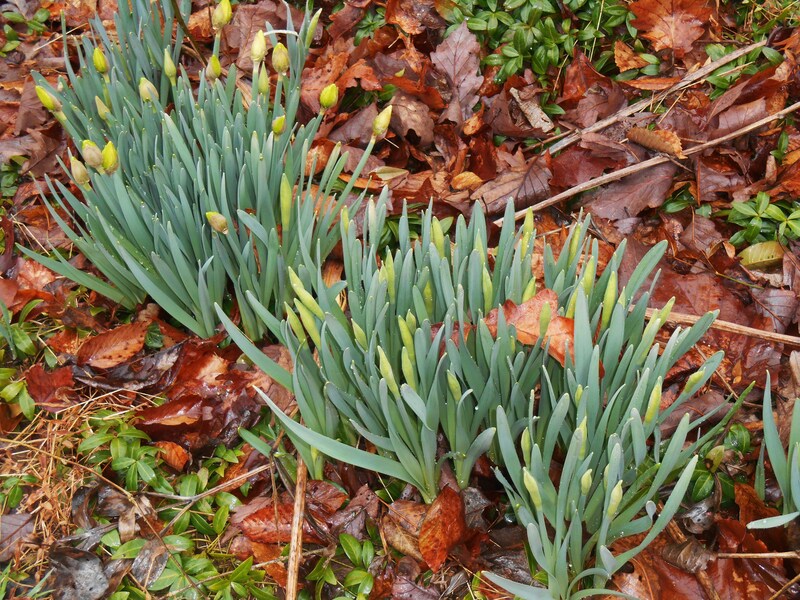 New daffodil leaves emerge each day. 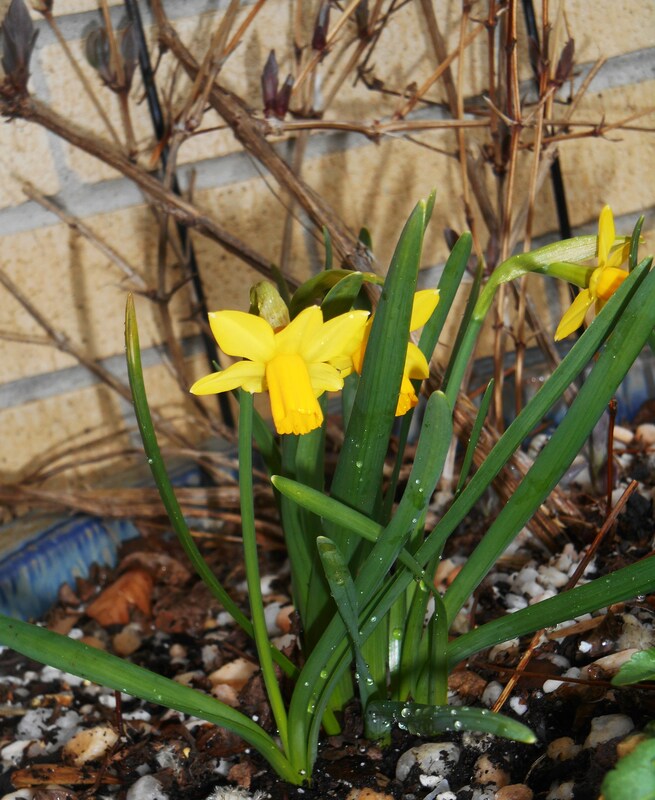 Tete-a-Tete daffodils bloom in a pot with a budding Clematis vine. 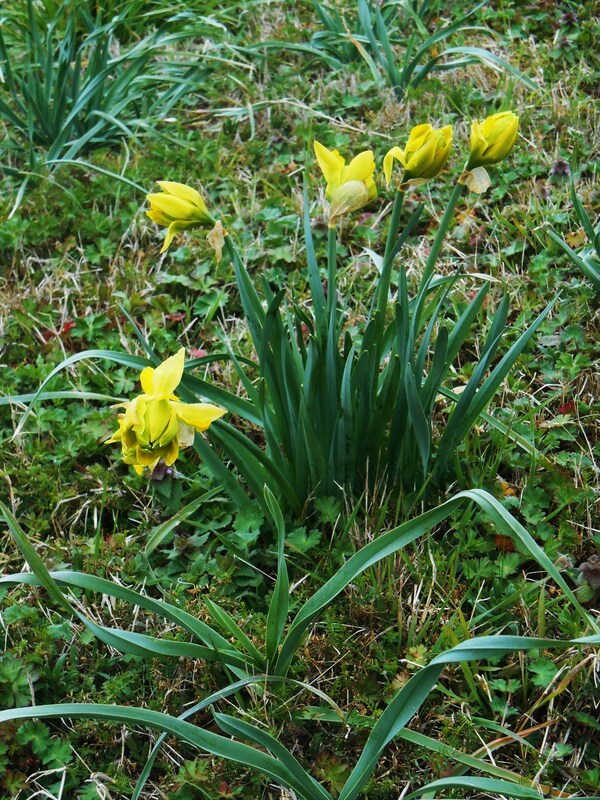 A single bright yellow daffodil blossom magically appeared over night on Tuesday in a pot near the drive, and a spray of tiny Tete-a-Tete daffodils opened the following day in the pot where a Clematis vine has already budded out. Their cheerful golden trumpets brighten up this soggy Saturday. Mid-March is muddy here in Williamsburg. We are happy for the mud, however, as it shows us the ground has thawed. Our last snow-pile finally melted by Thursday morning. Now little bits of fresh growth have begun to emerge in the oddest places. Bright moss shines along the front walk. Deep rosy red buds appeared this week on the roses, beckoning me to finally trust that the worst of winter has passed and cut them back. 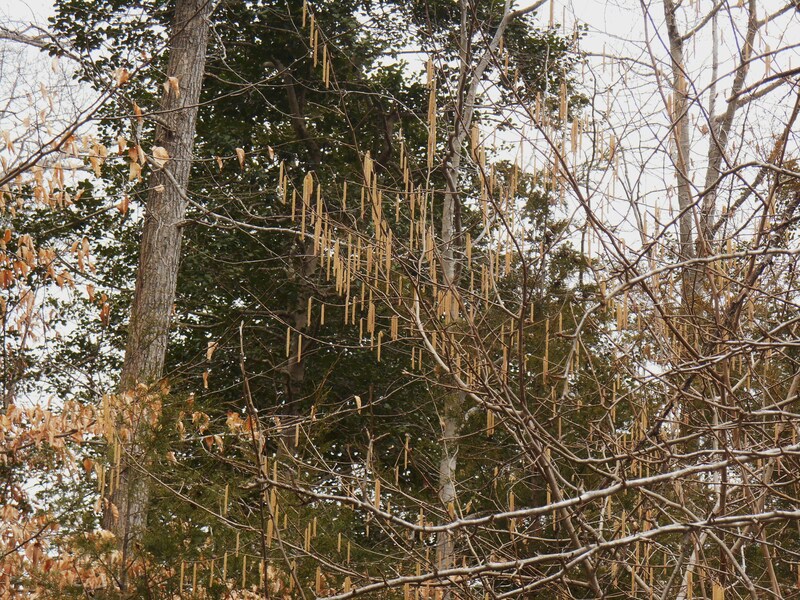 We’re walking around, taking stock; cleaning up what winter left behind. Somehow a box of bare root Siberian Iris came home with us from Sam’s Club, and I scooped out moist holes for their roots yesterday. 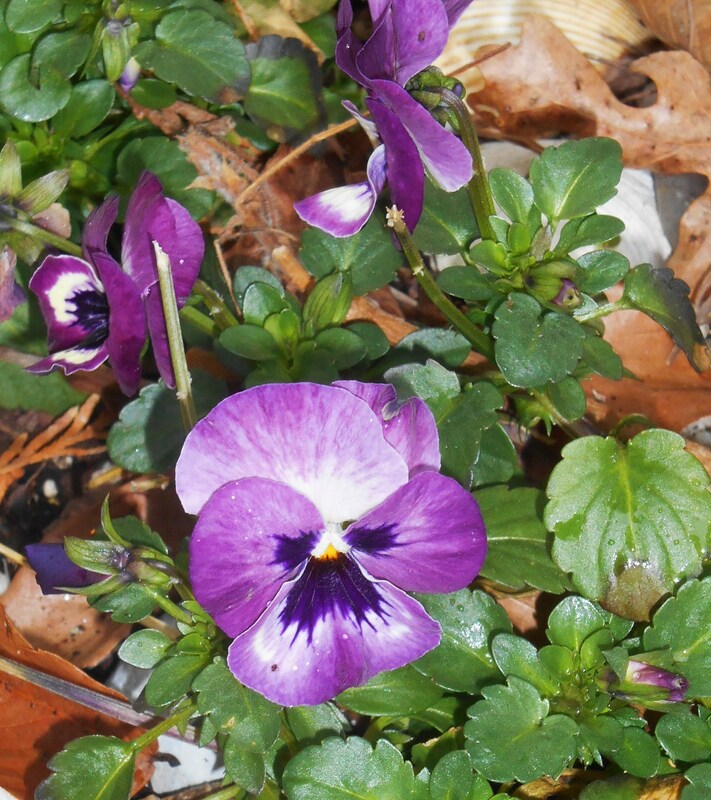 I love their deep purple flowers waving in the warm May breeze. They spread and multiply rapidly, making thick stands of saturated color as the Azaleas fade each year. A bare root white Clematis from the same package now grows along a fence. 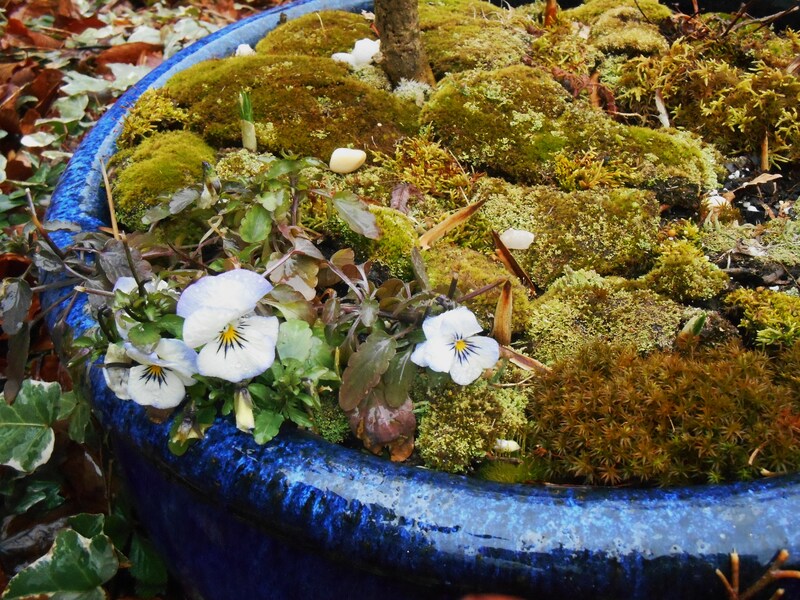 A fitting surprise waited for me in the old bag of potting soil which has lingered beneath the wheelbarrow these last frozen months. I opened it to fill a pot for the second Clematis yesterday, and found little shoots of green already growing in the mix. Apparently, this was soil I had scooped out of a pot at the end of the season to save, forgetting there were tiny bulbs mixed in from another spring. 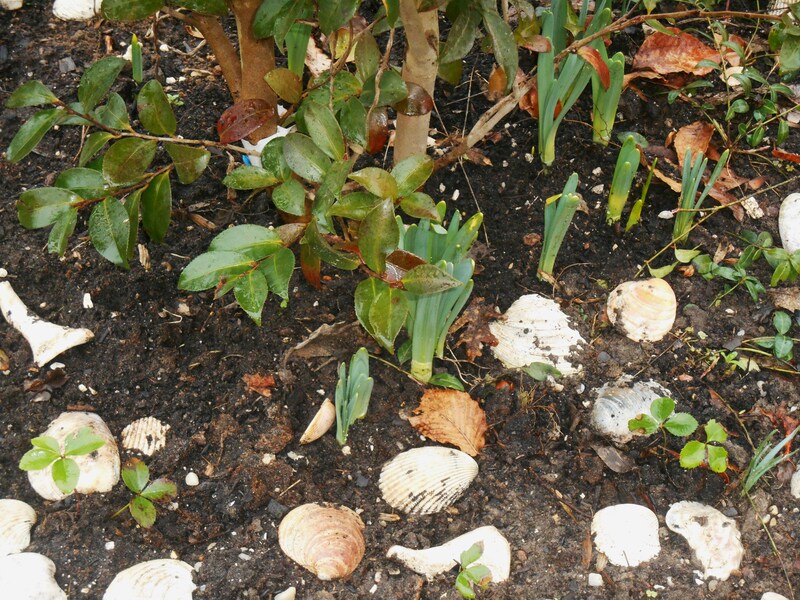 The bulbs sprouted anyway, and their leaves were poking out of the moist soil. I rescued them from the bag and tucked them into pots where they can prosper in the sun. 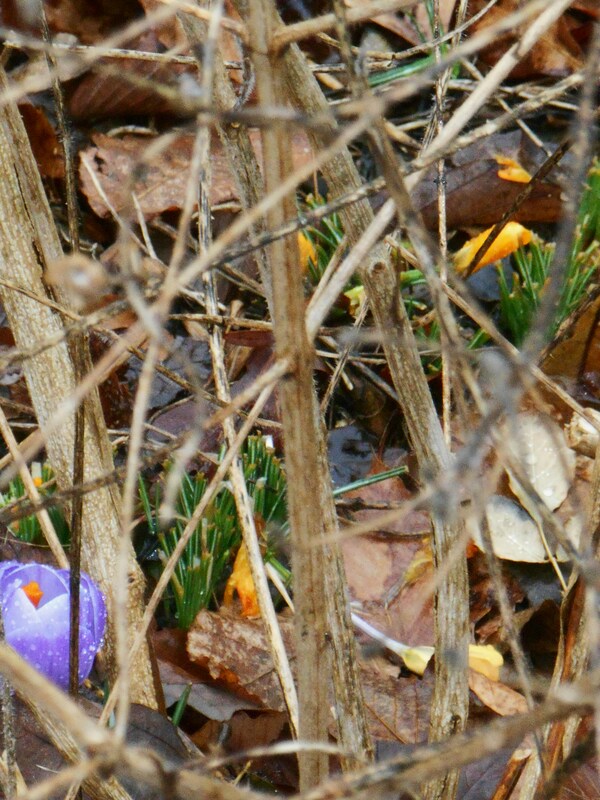 Crocus emerge beneath a woody web of Lantana stems. We want to wait until the weather settles a bit more before cutting the Lantana back for spring. Always filled with interesting surprises, spring cheers me like no other season. 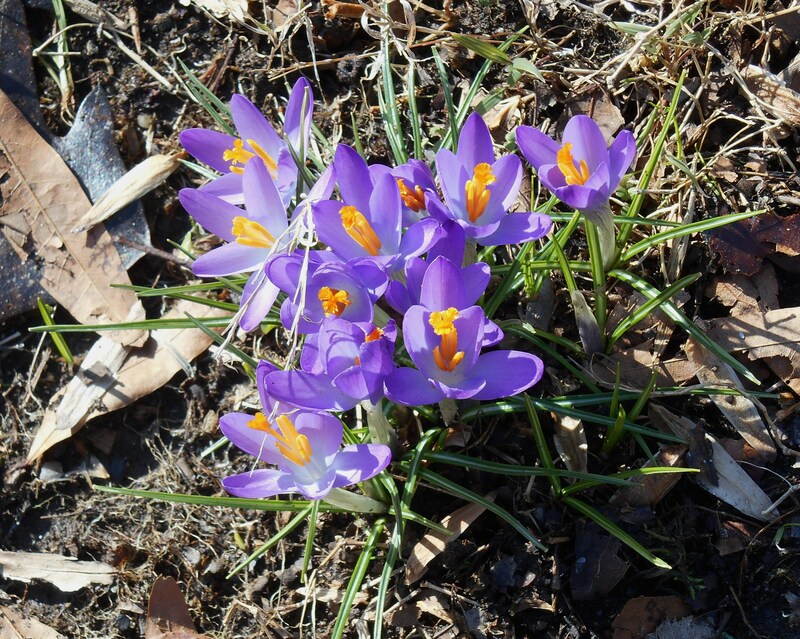 As each perennial emerges from its winter rest, as each bulb breaks the Earth with its brilliant green leaves and each fruit tree bursts into flowers; I am reminded again that life is full of beautiful surprises. 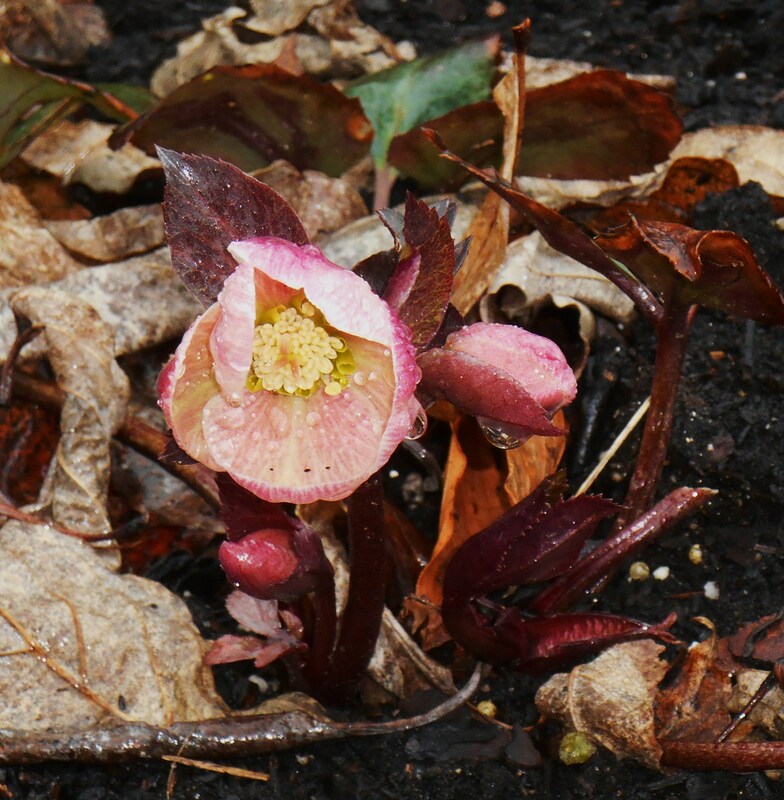 Our gardens, like our own lives, remain perennially capable of new growth. Although we don’t find it in every season, the potential remains. When the soil is warm and moist, things always grow. Whether that growth is what we planned or whether it ends up a straggler which blew in from elsewhere; the soil covers itself with interesting leaves, spreading stems, and sometimes a delicate flower. 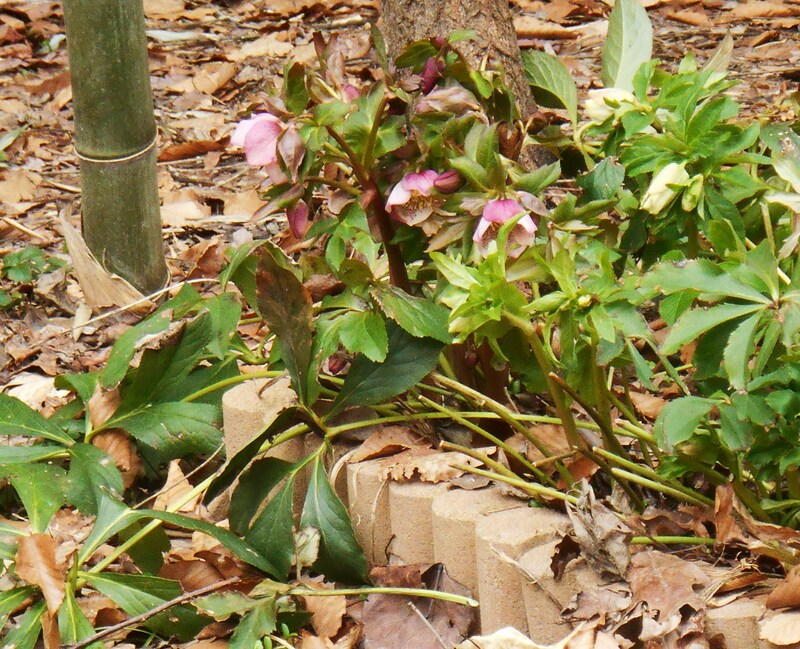 I’ve transplanted Hellebores seedlings to grow beneath this Camellia shrub. They will make a lovely ground cover in a few years. The sun beckons, even as rain clouds mute its life giving rays. 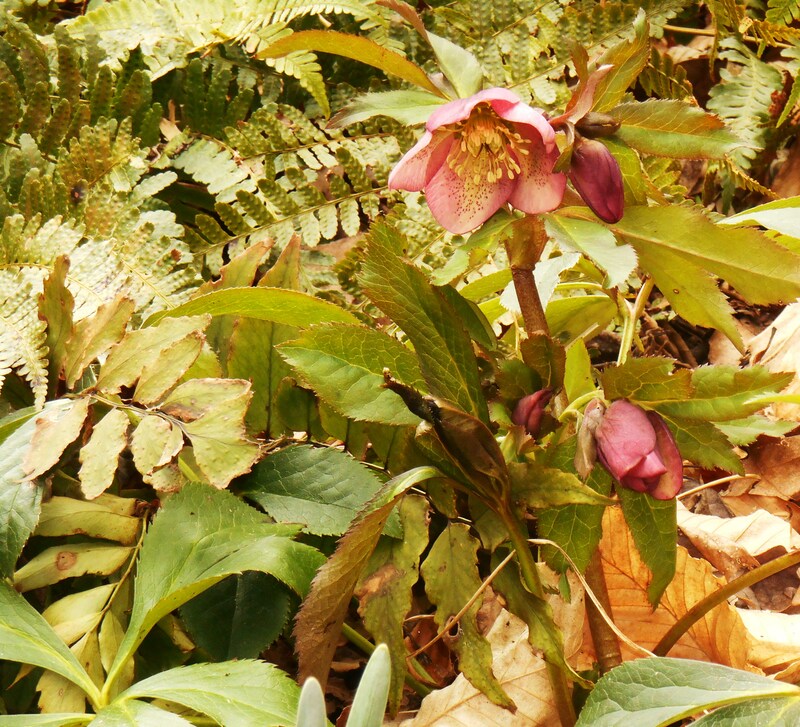 March: the month when our garden awakens to spring. May all of its verdant possibilities inspire you. By whatever moniker, it proves a dull and washed out shade of brown. Or perhaps a dark faded khaki? This color looks to me as though it has been through the washer a time or ten too many. 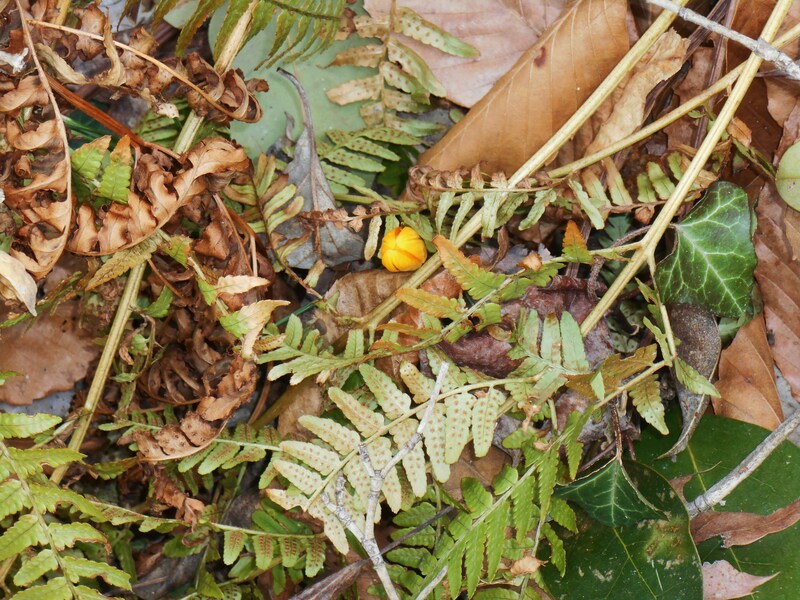 It is the color still most prominent in our garden: the color of winter bleached leaves and long dead stems; spores, and cold scorched foliage. But from such as this is the newness of spring nurtured. It holds life, potential, promise. And so as always, I want to thank Jenny for choosing the perfect color again this week. 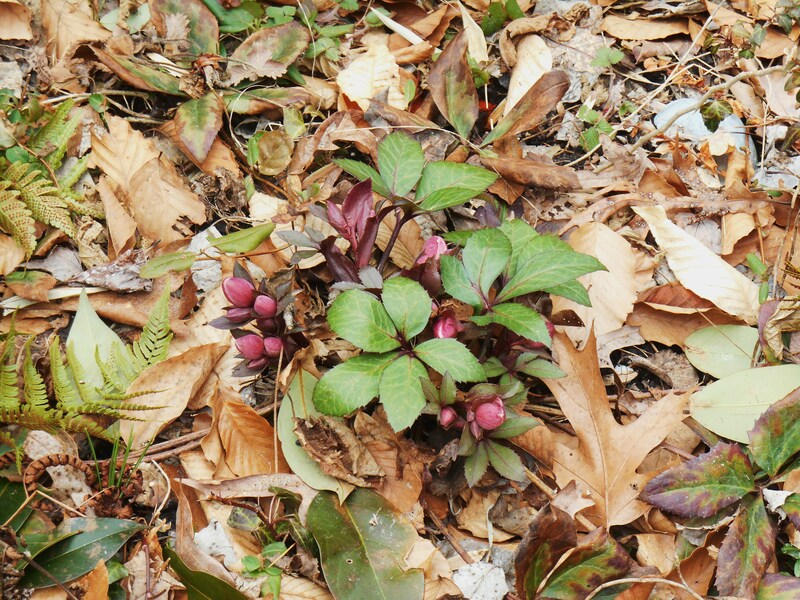 In searching for ‘beaver brown’ I was able to look beyond it and find more signs of change; more promises of spring’s return. Saffron may also be described as “pollen yellow.” Saffron, the spice, comes from the stamens of a particular cultivar of Crocus. One of the most expensive of all of the spices, it has been cultivated and treasured for many centuries. Such a rich warm color! 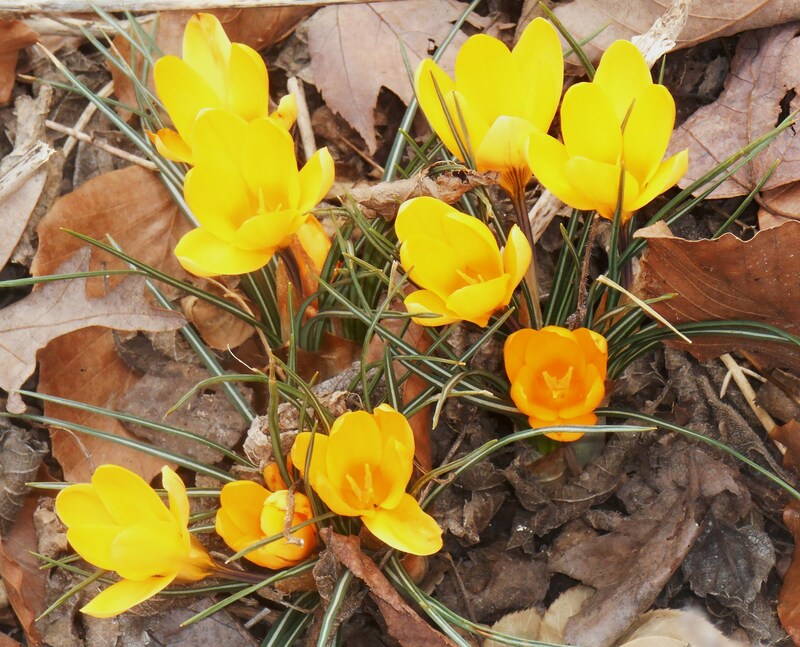 How nice it would be if I were posting more photos of our own early saffron yellow Crocuses today, but that will have to wait. Ours are resting under 6 inches of fresh snow. 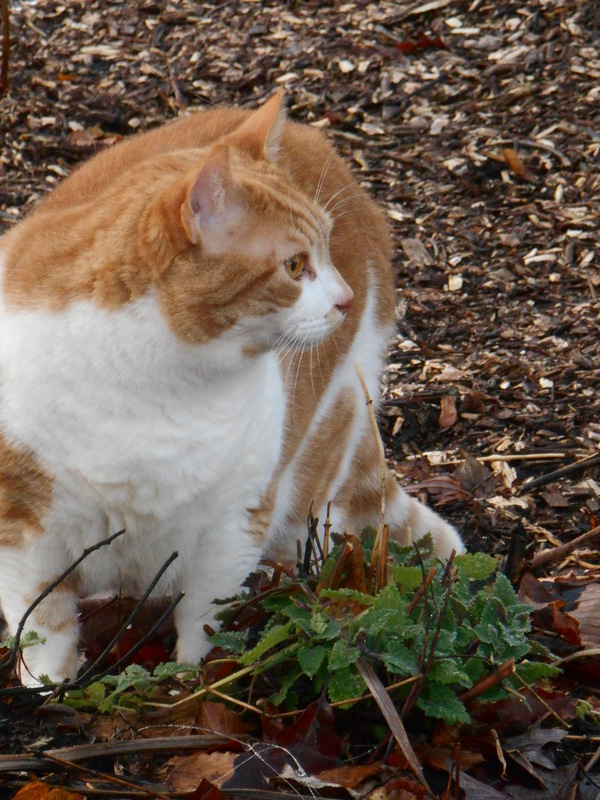 The yard is beautiful, but there will be no ‘saffron’ photos taken in the garden today! This winter has been so long and cold that no part of me want to show you photos of the snow. I’ll stick with photos of flowers, if you don’t mind. Our front border last March 22. We had a cold, late spring last year. I wonder when we’ll see these appear again? 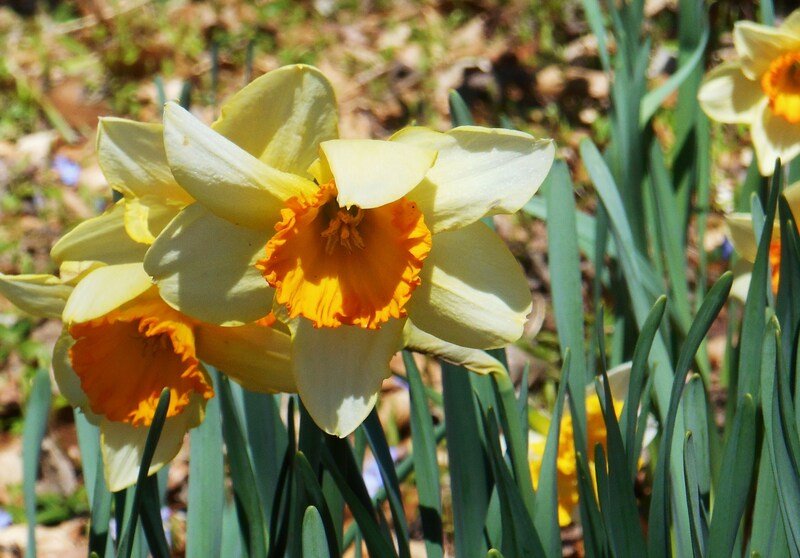 I’ve looked back into the photo files from last spring to find a bit of golden yellow saffron for Jenny’s challenge today. 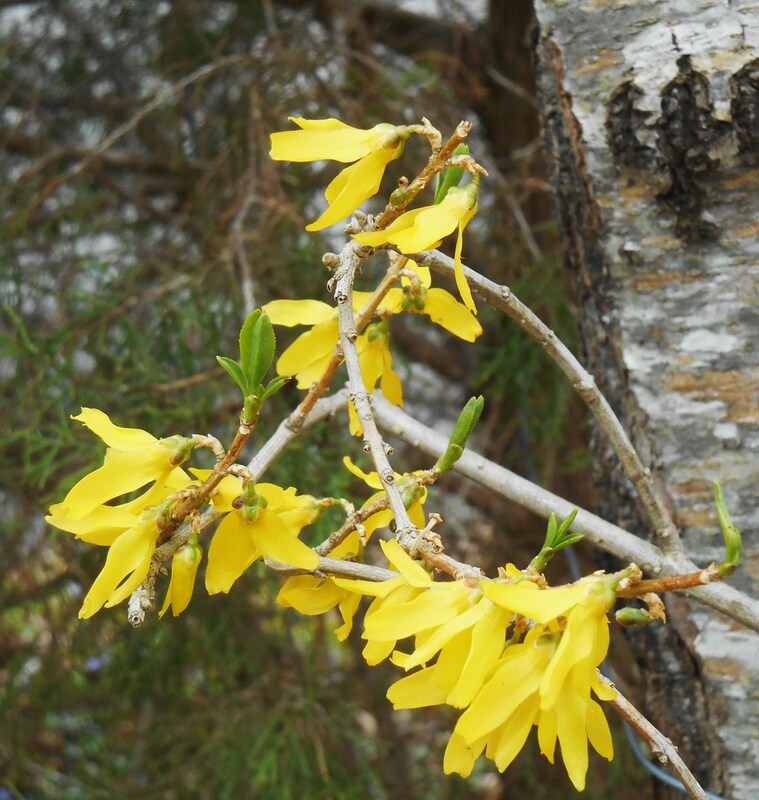 Have you ever noticed that the very first flowers each spring are usually golden yellow? 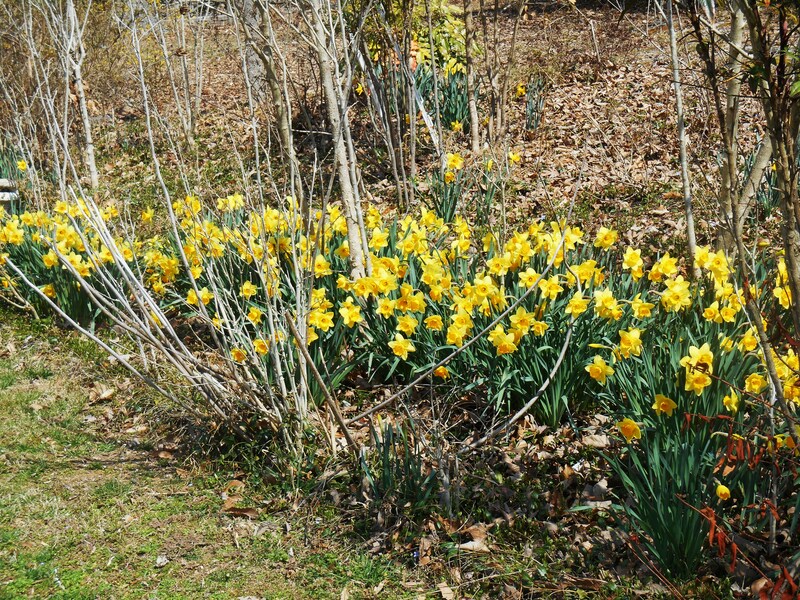 Yellow Crocus, Forsythia, Witch Hazel, Dandelions, and Daffodils usher in each spring. 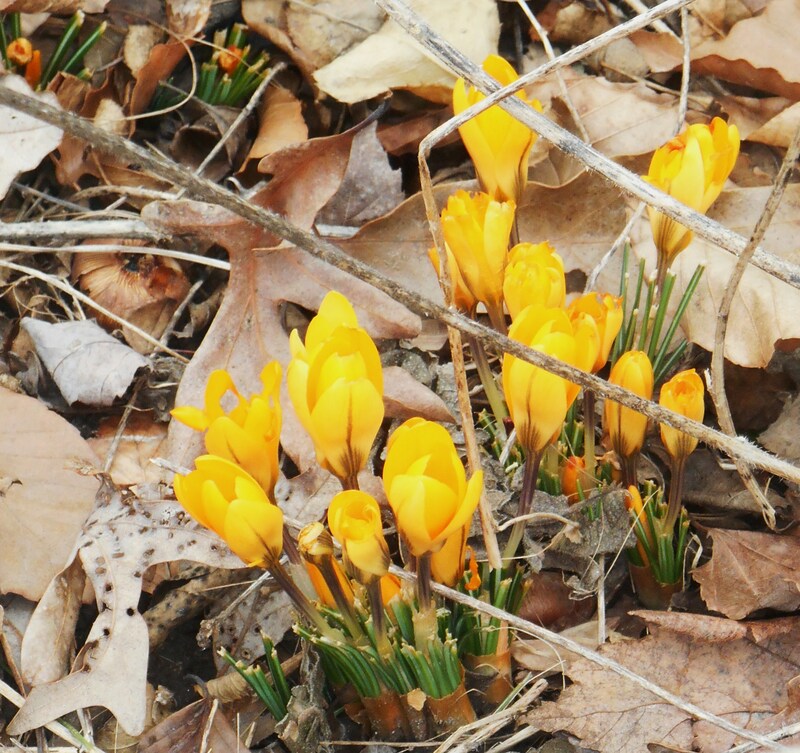 I hope you enjoy them, and know that this year’s saffron yellow flowers will emerge from the thawing ground any time now. 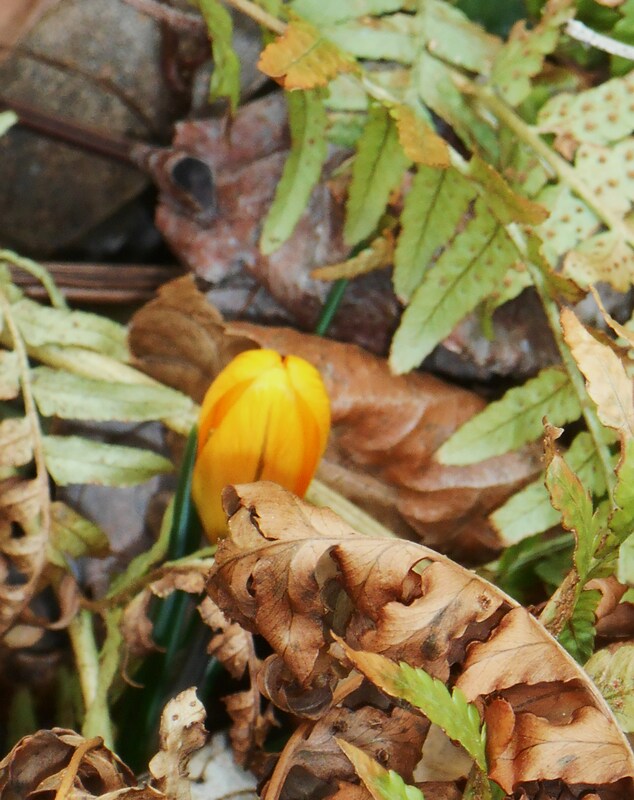 Our yellow crocuses are currently under the snow. This photo of them was taken March 2, 2014. See more photos of Saffron here.